Combining breakthrough technology with the precision of scientific sharpshooters, UNL researchers are shrinking the massive space needed for synchrotron X-rays to the size of a tabletop. This promises to expand potential uses of these high-quality X-rays. The team developed a unique way to generate synchrotron X-rays using UNL’s powerful and compact Diocles laser. 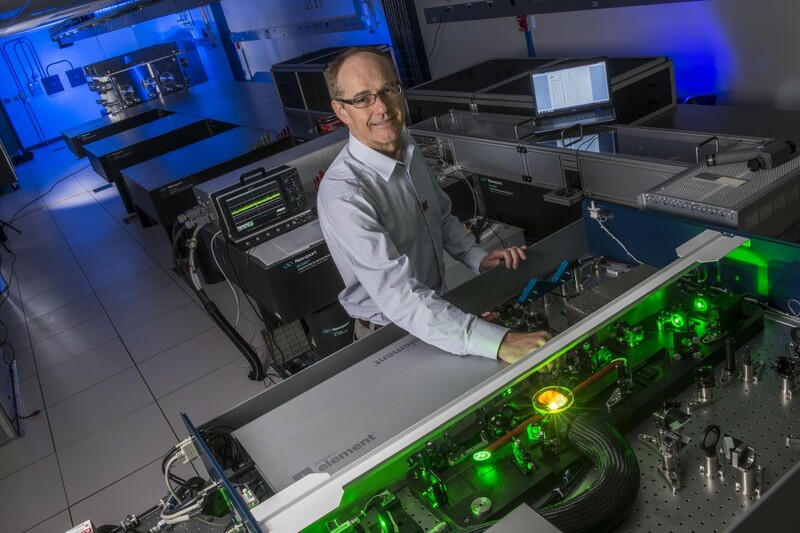 “The X-ray source we developed is the first and only of its kind in the world and establishes an entirely new class of technology,” said Donald Umstadter, Leland J. and Dorothy H. Olson Chair of Atomic, Molecular and Optical Physics and director of UNL’s Extreme Light Laboratory. 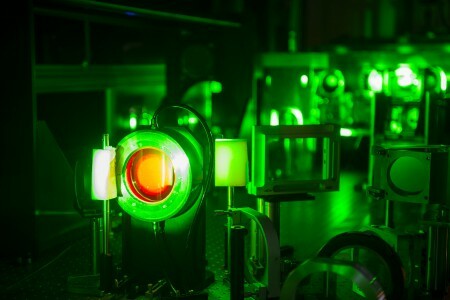 The team reported results in Nature Photonics, the top-ranked optics journal. 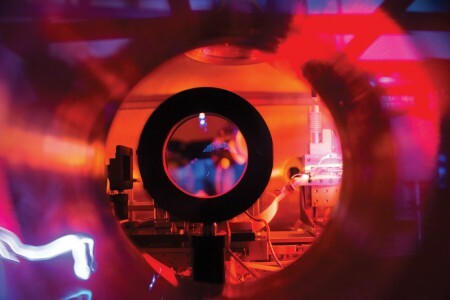 To produce the X-rays, researchers focused their laser beam onto a gas jet, creating a beam of relativistic electrons, then focused another laser beam onto the accelerated electron beam. This collision rapidly vibrated the electrons, making them emit a bright burst of synchrotron X-rays – a process called Compton scattering. The light’s photon energy increased by a million-fold, yet the combined length of the accelerator and synchrotron was under an inch. Colliding the micro-thin laser beams was key. “Our aim and timing needed to be as good as that of two sharpshooters attempting to collide their bullets in midair, but our bullets travel at nearly the speed of light,” Umstadter said. Synchrotron X-rays, prized for clarity and lower doses of radiation, require huge, expensive devices larger than a football stadium. Diocles is a tabletop laser, small enough to fit in a large truck, yet delivering up to 1 petawatt of power. It’s among the world’s most powerful compact lasers. The breakthrough can expand the X-rays’ availability and use to ultrafast science in the lab, medical imaging in hospitals and defense and security applications in the field. The Department of Energy, Air Force Office of Scientific Research, Department of Homeland Security, Defense Advanced Research Projects Agency and the University of Nebraska’s National Strategic Research Institute, a Department of Defense-sponsored University Affiliated Research Center, helped fund this research.